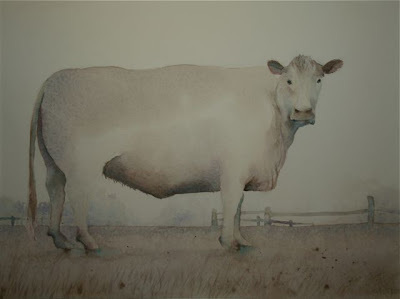 Hi David - excellent cow with that certain look which makes me ponder abstract existential questions and decisions. Funny what 2 dots placed in a particular way on a face can do. A pleasure to see your new work! Thanks Bill, we have 4 of these grey cows, they're solid and slow, emanate peace. I see nice granulations of colours there. I happy to see your new works, keep up the good job ! My, your blog is beautiful. So sorry to read about your loss. I am left wondering about your father's violin.